LA PAZ, Bolivia – The Bolivian government is promoting traditional indigenous medicine by sponsoring two intercultural pharmacies and by pledging $10 million towards the development of a larger “pharmaceutical enterprise” according to press statements. Bolivia’s Health Minister Ramiro Tapia announced Dec. 29 the opening of the two pharmacies that will offer “ancestral medicine” prescribed by traditional healers known as kallawayas as well as modern Western drugs ordered by contemporary physicians. The conference began with a blessing ceremony where kallawayas “prayed for good results to Pachamama (mother earth)” and burned sweet herbs, coca leaves and other items of significance in Andean indigenous cultures. Rada explained that the intercultural pharmacies will offer remedies developed by modern laboratories that are registered with the Health Ministry, and that in the connected health centers there will be modern doctors and kallawayas that will be available for consultation. He noted that the Health Ministry has already registered traditional medicines such as coca leaf syrup, maca (an Andean tuber) powder used as a stimulant, valerian root oil, which is a sedative or calmative used for anxiety, and torunco ointment that is used for treating rheumatism. In the week following the press conference about the pharmacies, the Health Ministry also announced that the Bolivian government would invest $10 million into a pharmaceutical enterprise involving the traditional remedies. The Health Minister, on behalf of the government, signed an agreement with a group of kallawayas and a representative of the Major University of San Andres that will allow researchers to investigate and then formally register natural medicines that are being used in Bolivia already but without any official monitoring or control. He also stated that national surveys indicated that 60 percent of Bolivians turn to natural prescriptions before going to a modern physician. “What we will be doing is to guarantee access to formally registered medications, that are scientifically proven and lawfully dispensed,” said Igor Pardo, a director at the Health Ministry. Towards that end, the university’s faculty of pharmaceutical science and biochemistry will develop a germplasm – defined as “the hereditary material of germ cells” – bank and a herbarium where scientists would collect and study a variety of plant specimens to be potentially used by the intercultural medications industry. Pardo also noted that upon winning the election in 2006, Morales has directed the Health Ministry to develop programs connecting Western medicine with indigenous practices. Since the onset of this policy, modern doctors in Bolivia have often turned to kallawayas to accompany them on journeys to remote Andean regions to assist in delivering babies; and it is in those areas that people traditionally have more trust in natural healers. 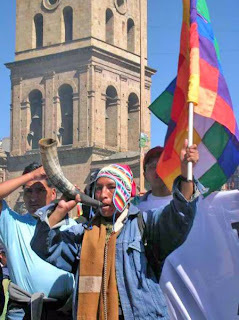 That same mandate led Morales to institute a Vice Ministry of Traditional and Intercultural Medicine that was charged with “promoting, protecting and looking after the preservation and strengthening of traditional medicines, in accordance with the knowledge and wisdom of the indigenous cultures,” according to Bolivia’s Health Ministry Web site.